Some of my collage works are in more traditional frames rather than tins. Usually they are constructed using tiny fragments and carefully scalpel-cut slivers of different sorts of paper and some elements stand proud of the background surface to give a 3d appearance to the final piece. The papers I use are sometimes bought specially and sometimes taken from my collection of sheets and scraps accumulated during my years working at paper and bookbinding material shops. 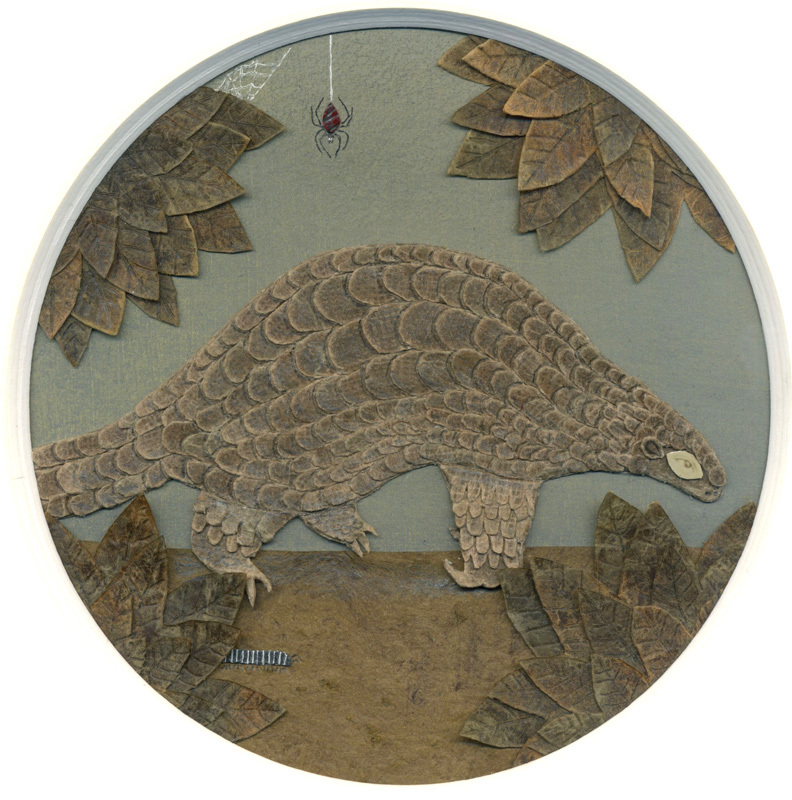 Although the pangolin here (along with the Chongololo and spider) is a Zimbabwean one, the papers he is constructed with are from all over the world. Waxed Nepalese Lokta, Mexican bark paper, and Italian watercolour paper all were used. Each scale is individually cut and millimetres across. The eye is a cutout from an Edwardian studio photograph. The colours (my usual palette anyway) are in keeping with a zoological illustration that might have come from that period too. ​Mixed media on paper, Edwardian Photograph 11cm diameter approx.